The 4/1 shot settled nicely for the champion jockey in the early stages of the race and he was produced with a perfectly-timed run to collar Gary Moore's gelding on the run-in to record his first victory over fence since winning the Grade Two Lightning Chase at Doncaster in January, 2012. Trainer Nicky Henderson was delighted for the horse as he has not been without his problems during his career to date. "It's really nice to see him win as he's a hot-headed devil sometimes and it's been a job to get him settled," said the trainer. "Life's not been kind to him really, some of which has been his own fault and some which hasn't. He had that horrible experience at Newbury and then nearly died when he fell at Lingfield which has affected him a little. "I feel he's improved again this season as he's much more relaxed at home which has helped him settle a little better. He's also strengthened up as well. He also had a wind operation over the summer, not because he was making a noise but because I just thought it might help him a bit. "A P has given him a beautiful ride, unsurprisingly, which has no doubt helped him win. I've always thought he was a two miler but now he's settling better, I may try him over further as he's certainly bred to get it." 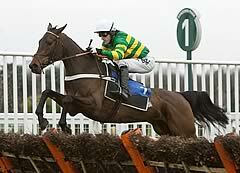 A P McCoy, the record-breaking 18-time champion jump jockey, partnered his second winner of The Open 2013 on Kid Cassidy in the Shloer Chase. He said: "This horse has plenty of ability - he liked a bit of dead ground which gave him a chance of getting back into it. "When he was coming down the hill, he was half off the bridle. He is such a free-running horse early in his races, you just have to get him relaxed and then hopefully let him enjoy it. I needed to hold on to him and ride him to come home. The man I am riding for lets me make my own mistakes. "It is nice for the horse to win - he has not had the most straightforward career. I hacked him down to the start - if I had let him go at all, he would have taken off. It helped that there was a nice gallop today and I could sit and pray they would come back to me. "He has not won for a long time and I wanted to give him confidence. I came to the bend and thought he had a good chance of winning. I am pleased for horse because he has had a tough life after what happened to him at Newbury a few years ago. "He could not win a Grand Annual last year so unless he has improved I don't think he would win a Queen Mother Champion Chase." 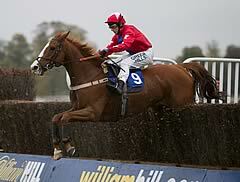 Aspirations for Sire De Grugy were dashed in the Shloer Chase when he was beaten into second by Kid Cassidy. The 4/1, A P McCoy-ridden winner scored by three and a quarter lengths from the 5/6 favourite, although the vanquished Sire De Grugy was conceding 10lb. However, talk of him being a danger to Sprinter Sacre seems fanciful now. Trainer Gary Moore was not at Cheltenham, but his son, Jamie, who rode Sire De Grugy, said: "I was beaten fair and square. I'm gutted, and it's burst a bit of a bubble - after he won at Chepstow recently we were thinking he was a very good horse, but he was found out today and just wasn't good enough. "He didn't lose any ground at the fences, but he was a little exuberant and has done that here once before. He was a little too long a couple of times and did well to stand up. "I couldn't get into a great rhythm, but it didn't slow him down - he's obviously not quite as good as I thought. Kid Cassidy is obviously pretty good and there's still good prize money to be won with our horses." Henry De Bromhead was happy with the performance of third-placed Special Tiara who made the running, was headed in the home straight by the first pair, but stayed on well to be beaten a further three lengths. 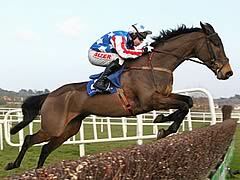 De Bromhead said: "He stayed on up the hill and I'm delighted with him. It was a blinder for his first spin around here and Noel [Fehily] was sitting on him for the first time. He jumped a bit big early, but we know he's a better horse on faster ground."